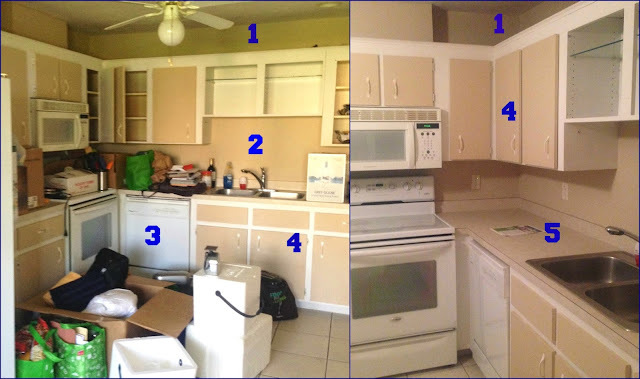 Hit the Ground Running: Kitchen Updates! 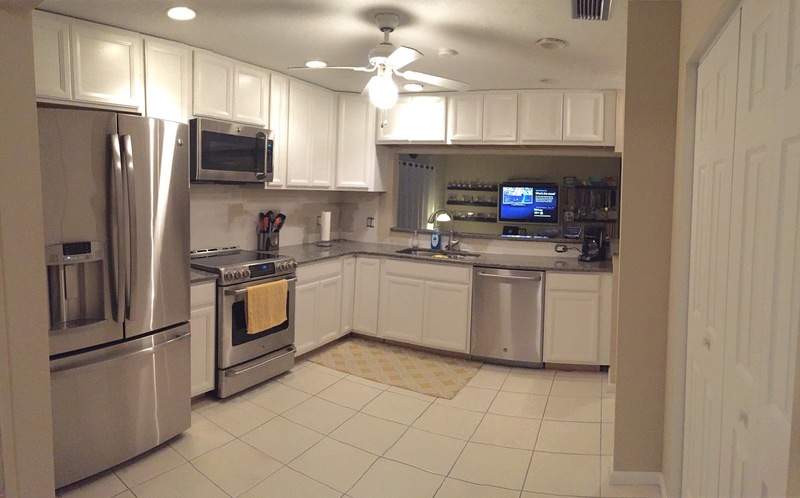 Well, it's been over a year since we got started on this project, but the kitchen is finally...done? 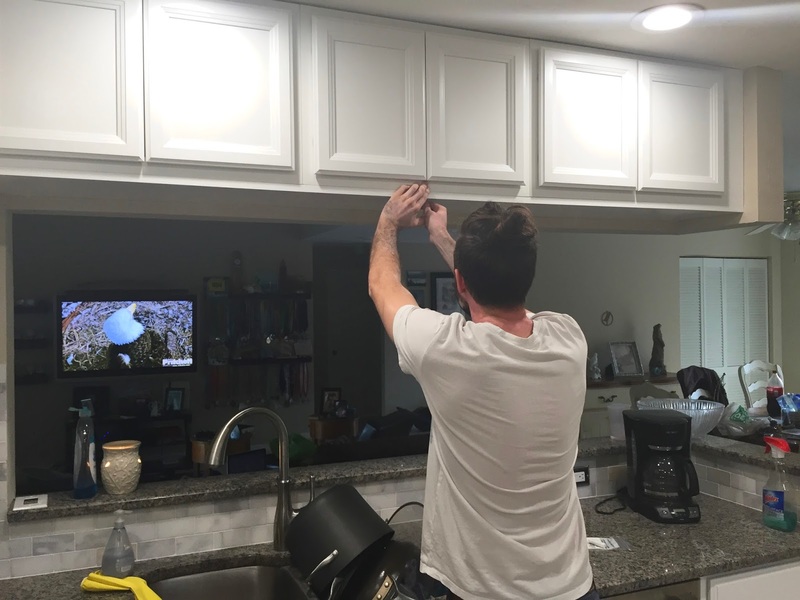 I mean, we still have hardware to install on the cabinets and I'd still like a new fan...and the breakfast nook is still being used for storage...but the kitchen itself - backsplash, kickboards, and trim - are finished! The numbers are things we wanted to fix. See below. Cabinets, appliances, layout, counter, and wall are all taken care of! The backsplash took about three days start-to-finish. First, we met Dave and Tammy at Floor & Decor to pick up our supplies. We finally found a backsplash Matt and I could agree on - he finally agreed to white after we brought home some samples and decided it fit our kitchen best. We wanted subway tile originally, but both agreed the quartz/marble white/gray looked best and was best for resale. We also picked up thin set, grout (we had to pick a color for that too! Who knew? ), and sealant. Then, as we got started, we realized we'd need a real wet saw to cut the tiles accurately, so Dave and Matt went off to rent one while Tammy and I did what we could with the full sheets, individual tiles, and a tile-clipper tool. We worked into the evening. Once I learned how to properly go through all the steps, it was fairly easy. 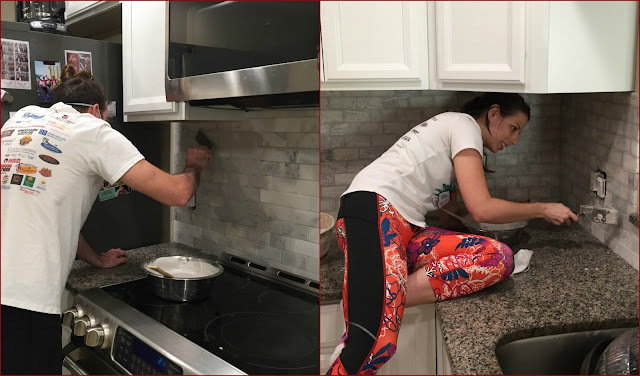 Tammy and I did the majority of the actual tile-laying while Matt and Dave cut tiles to our specifications so they'd fit perfectly. When the backsplash was done, I sealed it for the first time. Matt and Dave measure the first set of cuts for the pass-through wall. Fitting everything around the sockets was the hardest part, but Tammy and I are pros now! 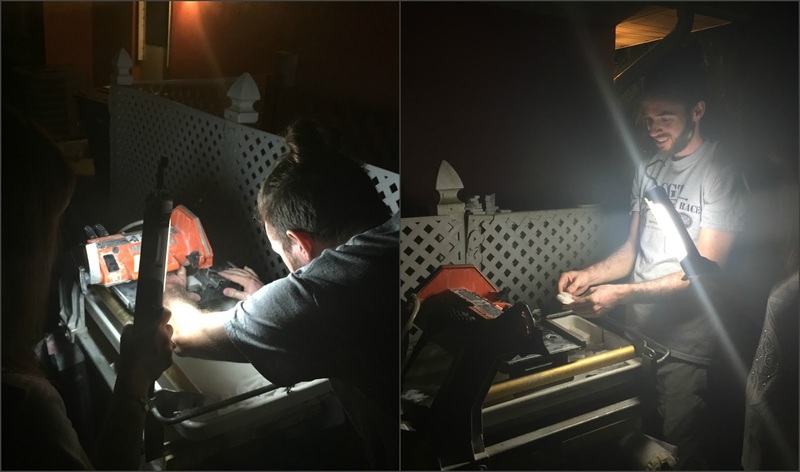 Matt using the wet saw after sunset with Tammy's help as the lantern-holder. The next day (Day 2: New Year's Eve) Matt and I grouted the kitchen. My shoulders were so tired and weak from the previous day! We managed to get it all done, let it set, and wipe it down...by the time we were done, it was past midnight and officially 2017. I sealed it a second time and we called it a night. The grout was the hardest part...not grouting itself, but scrubbing it off afterward! We changed our outlet covers to stainless steel to match the rest of the appliances. On the Monday following New Years, Elizabeth and Roniel came over so Roniel could work on our next project and help us get started on that, but he also installed our kickboards and finishing "trim" under the high cabinets. This was a job I thought would take a few hours; when I told Tammy that, she laughed at me - with good reason! I'm amazed at how much work it took! But I felt really accomplished when we had finished, and I love how it looks! And I especially love that we did it all ourselves! The mini wall behind the sink was completely my work (other than the cutting), so I can look at that perfect little space and know I did that. I am ecstatic that this project is nearly finished! The kitchen itself is done; we're down to the finishing touches. It's been fun, but I'm going to be so glad when we can stop thinking about "what's next" for this room in the house. Have you ever tiled anything in your house? 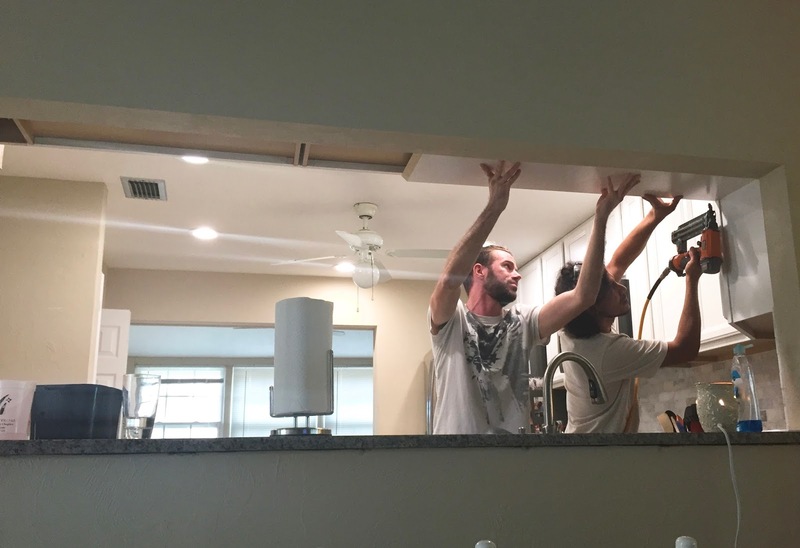 Do you prefer DIY or hiring experts? Looks great ! I did a very minor update in my kitchen by changing the cabinet handles, small but effective since the old ones were very dated. I don't trust my skills to take on much more than that. It looks awesome Ali....and it is such accomplishement to do it yourself. I've laid laminate flooring and it always amazes me how much longer it takes than I thought it would. 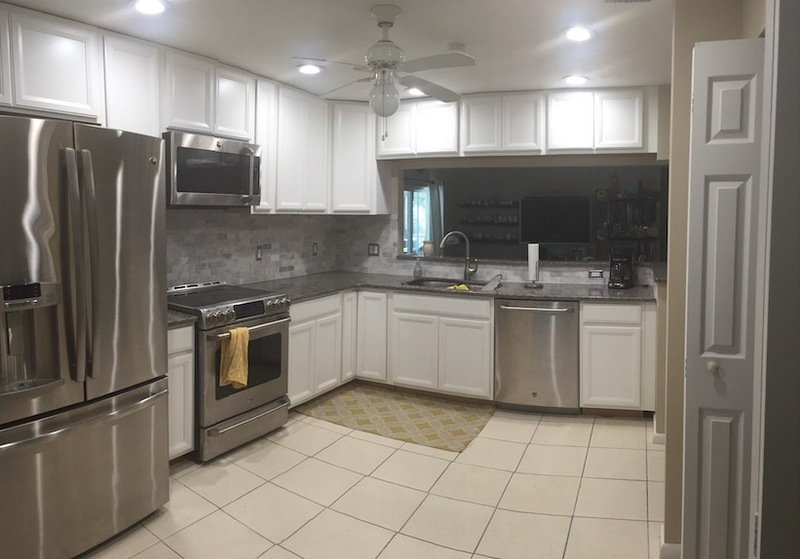 You guys did an amazing job on your kitchen, I couldn't imagine doing such an upgrade on my own! Since moving into our house last June, we haven't had too many projects yet, but I still need to get hardware for our kitchen cabinets! I'm hoping to do a DIY patio install in the back of the house but I'm nervous about screwing it up! My boyfriend already built a retaining wall out front and that turned out great. WOW looks amazing! What a transformation! 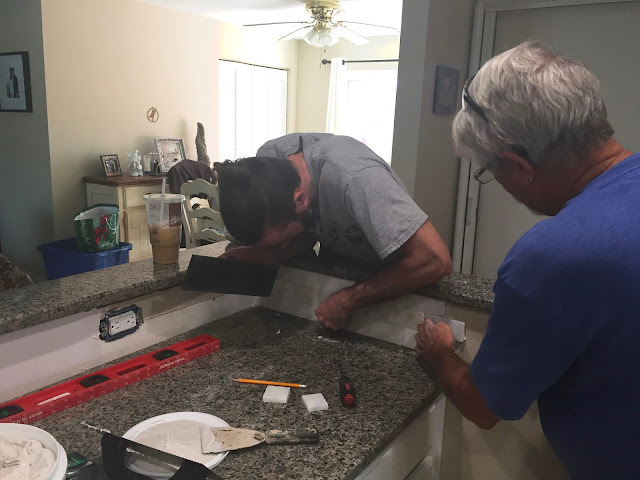 Installing a new kitchen backsplash is our next big project. We have the tiles picked out and sitting in the house. Now that I know what's in store I am (even more) nervous! I'm so worried about the tiles not lining up perfectly and finding them annoying for the rest of my life! I am not a DIY person at all, I lack skills in this area for sure. I wish I was!! Wow!! you are super talented! the kitchen looks amazing! How long has it taken you to update the whole kitchen? The idea seems daunting ! I would absolutely hire somebody, I don't have the creative and patient gene to figure it all out! OMG this looks amazing Ali! You guys did such a great job. I like the idea of doing a DIY but it depends on the size of the project!